The agricultural industry is a vital part of southwestern Ontario’s economy. Located within arguably the top productive land in Ontario the Lower Thames Valley Watershed is home to some of the most innovative farmers in the province. To see some of the variety of crops, vegetables and fruits grown in the Lower Thames Valley Watershed click here. What are Best Management Practices (BMP’s)? Best management practices (BMP’S) have been developed through the help of various organizations and industry experts such as Ontario Ministry of Agriculture, Food and Rural Affairs (OMAFRA), Ontario Federation of Agriculture (OFA) and other organizations BMP’s offer both environmental benefits as well as, long term economic benefits to your farm – even though at first they may not be obvious! Not one BMP will solve all of your on farm problems, it will take a variety of BMP’s working together to prevent any environmental concerns on your farm! What are the different types of Best Management Practices (BMP’s)? Agricultural Improvement Fund (AIF) is a grant available to all farmers across the Lower Thames Watershed. This program is administered by the Lower Thames Valley Conservation Authority. We bought our first farm a year and a half ago and we identified that there were a few high priority projects to improve the farm one of which being a bed level crossing. Through contact with the LTVCA we were able to find a cost effective solution to be able to cross the Talbot Creek without damaging our machinery or our environment. My wife and I saw the advertisement in the Ontario Farmer for the Species at Risk Farm Improvement Program (SARFIP) and through completion of an Environmental Farm Plan we were able to apply to the SARFIP program for funding to help my wife and I offset the costs. I am very happy with the help and input from the LTVCA to make this project a success. Farming is my livelihood and this project was something that made sense for the long term viability of our farm. I am a do things right the first time kind of person, so this bed level crossing made sense to us and our farm. I hope to soon be in the early stages of our next farm improvements and the local habitat. We plan on creating a berm, as well as a retention pond and improved tree plantings. These will help to capture runoff and prevent erosion while also creating a permanent wetland for native wildlife. Some places around the world severely neglect water ecosystems and I appreciate all the help put forth to make this stewardship project a reality and assisting my wife and I in doing the right thing. We are all only here a short time, so let’s give back to nature and create good examples and an improved future for generations to come! Phosphorus Loading- Why Is It a Problem Again? Harmful Algae Blooms (HABs) have grown in attention over the last number of years. To learn more about HABs and what causes them click our fact sheet below. Federal, provincial and state governments acted to form an International Joint Commission that developed regulations and restrictions for phosphorus entering the Great Lakes during the 1970’s. At this time, phosphorus was harming the waters due to the large amounts of effluent from household detergents, industrial and agricultural sources. These phosphorus pollutants were released from both identifiable point sources such as industry, and nonpoint sources such as field-surface runoff. -Are comprised primarily of soluble reactive phosphorus (SRP) and consequently are highly bioavailable for algal growth. -Are discharged in roughly equal daily amounts throughout the year. -Are relatively easy to measure. -Their loading can be reduced by point source controls. -Are comprised primarily of particulate phosphorus. -The particulate phosphorus has relatively low bioavailability, meaning it cannot immediately contribute to algal growth. -Are delivered to the Lake in pulses associated with runoff events. -Are relatively difficult to quantify. -Loading is highly variable from year to year, due to weather conditions. Soluble reactive phosphorus or SRP, is phosphorus that has been dissolved and is not visible in the water. This phosphorus is also called dissolved reactive phosphorus and “bioavailable” phosphorus, since it is immediately able to provide nutrients for plant and algae growth. It can be likened to a steroid for plants, causing high levels of growth to occur in a short period of time. The source of SRP is usually from industrial and municipal wastewaters. The reasons for the current problem levels of SRP are outlined below. Particulate phosphorus effects on plant and algae growth are less immediate, but contribute over time. Scientists are still trying to determine what is happening regarding particulate phosphorus and its role in algal blooms. Total phosphorus is the term used when SRP and particulate phosphorus levels in a water body are combined. Total phosphorus loading in Lake Erie during the late 1960’s averaged around 25,000 metric tonnes per year, most of which was from point sources. The lake was becoming eutrophic, producing excessive plant and algae growth which when dead, release harmful gases and reduce the amount of dissolved oxygen necessary for a healthy aquatic ecosystem. Major reductions to phosphorus loading were achieved over the 1970’s but the target load of 11,000 metric tonnes from all sources for Lake Erie was not met until 1981. Particulate phosphorus from nonpoint source runoff was reduced around the Great Lakes during the 1990’s by implementing erosion controls such as no-till, reduced-till and buffer strips. Since the early 1990’s, soluble reactive phosphorus loading has increased however, and was comparable to 1970’s levels from Ohio streams when measured in 2006. Both soluble reactive phosphorus (SRP) from households and industry, and SRP and particulate phosphorus levels from agricultural operations, are now a problem. Due to the large increase in SRP entering Lake Erie, the Canadian and U.S. governments have identified problem areas and target levels to achieve, starting in February 2016. Table 1 outlines the planned reduction to total phosphorus load and the areas that are major contributors to the current situation. A 20% reduction in total phosphorus is the target for the year 2020, with a 40% reduction in total phosphorus proposed by the year 2025. Scientists have determined that this reduction will result in excessive algal blooms occurring only once every ten years. The amount of phosphorus entering the Great Lakes is rising once again, but something else is happening to compound the problem. What Are the Reasons for the Current Phosphorus Problem? Precipitation events have been affecting the Great Lakes. Spring and summer once had lots of small precipitation events occurring, contributing “a little at a time.” Precipitation events now usually consist of large thunderstorms, causing heavy rainfalls that increase surface runoff from both urban and rural areas. This results in surges of phosphorus loading and algal blooms. The warmer temperatures are also leading to snowmelt events during the winter season. The resulting meltwater carries any phosphorus from fertilized fields into the streams, rivers and lakes, allowing large amounts of reactive phosphorus to be present when spring arrives. Large lakes normally undergo periods of stratification, during which they form several layers with different temperatures. In the past, winter cold used to form large ice layers on the surface. Particulate phosphorus that had settled to the bottom layer would slowly be converted to soluble reactive phosphorus (SRP) in the low oxygen or hypoxic conditions found there. Spring melt and warming water temperatures would cause “spring turnover” events, where the water layers would shift and mix, becoming one huge layer and releasing SRP to help fuel normal plant growth. The production of SRP from particulate P would stop since oxygen was now present in the bottom layer. Over time, stratification, sedimentation and decomposition would all reduce the oxygen levels and cause the bottom hypoxic layer to reform, and the cycle would begin again. The warmer temperatures now occurring due to climate change are not letting ice formation occur on the lake surface anymore. The hypoxic bottom layer of the Great Lakes is expanding and is present for much longer periods of time. This allows more SRP to be produced and made available for algae, cyanobacteria and plant growth (IJC 2014). All of the above changes to lakes contribute, but are not wholly responsible for the present Great Lakes water quality situation. Dreissenid mussels, which include Zebra and Quagga Mussels introduced from the Black Sea region of Eurasia, are changing the ecology of Lake Erie. Not only have these non-native invasive species taken over fish spawning sites and removed the food source of young native species, they’ve altered the normal biologic processes of the lake as well. -have changed the processing of particulate phosphorus in the Great Lakes, releasing it to the shoreline and increasing the contact it has with the water along the shoreline. Scientists are currently studying how this increases the production of bluegreen or Cladophora algae along shoreline locations. -filter lake water very efficiently, allowing sunlight to penetrate deeper than ever before. This results in larger amounts of algae and cyanobacteria to photosynthesize and reproduce and the resulting problems that occur (see below). -will not ingest toxin producing Cyanobacteria but do ingest many other bacteria, resulting in large amounts of Cyanobacteria to form in the lake. Bluegreen algae and Cyanobacteria reproduce and grow very quickly using the large amount of available phosphorus and sunlight now present in Lake Erie. Problems arise when the algae and bacteria are alive since large masses of this block sunlight from penetrating to oxygen producing plants normally found under the water surface. These plants die and subsequently oxygen is no longer available to underwater organisms. When the algae, bacteria and plants die the large biomass decomposes and releases large amounts of carbon dioxide and nitrogen into the water. This process further reduces the oxygen levels making it difficult for many fish and aquatic organisms to survive. Industrial, urban and rural sources are responsible for the increased SRP and particulate phosphorus entering our waters. Rural farming operations will play a big part in solving this problem, but all must work together to reduce current levels of phosphorus. 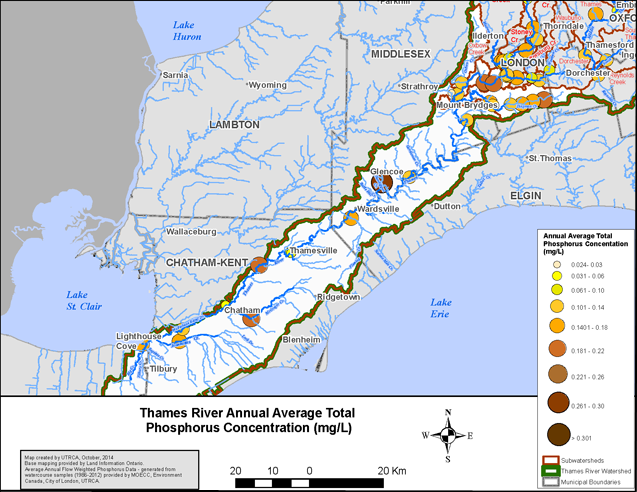 The Upper Thames River Conservation Authority initiated a study to identify causes of water quality problems in the Thames River watershed. The Water Quality Assessment in the Thames River Watershed – Nutrient and Sediment Sources (Freshwater Research, 2015) report identifies nutrient and sediment source areas contributing to phosphorus loading in the Thames River and subsequently to the western Lake Erie basin. It was determined that municipal and rural wastewater outflows and surface water runoff are all responsible for current total phosphorus levels. One major nonpoint source contributor of runoff particulate phosphorus mentioned in the Water Quality Assessment report is the McGregor Creek subwatershed (Fig. 1). One of the recommendations of the report is to implement nonpoint source actions to reduce nutrient loads and concentrations across the Thames River watershed. The purpose of this information package is to inform area farmers and landowners of the problem and reasons for implementing best management practice (BMP) options specifically aimed at soil types and landforms found in the McGregor Creek subwatershed. This information is also applicable to operations watershed wide. Assistance and funding to determine and implement BMP options is available. Incorporating Best Management Practices or BMPs in our agricultural operations can make a huge difference. -Runoff of fertilizer and manure application during spring snowmelt and heavy rains. -Soluble phosphorus loading through tile drainage systems is a factor, but recent studies show most phosphorus is entering our waterbodies from surface runoff. Studies have determined that the largest amount of phosphorus load from agricultural practices entering our waters is occurring during the winter months. -Lower water quality results in environmental impacts to fish and wildlife, drinking water as well as commercial and recreational use of natural resources. Always consider your tillage system first. Best Management Practices (BMPs) used for tillage, cover crops and crop rotation are the easiest, most cost effective things to implement before spending large amounts of money on surface drainage systems to reduce soil lost to overland water flow. BMPs contribute greatly to the effectiveness of existing structures and field alterations as well. -Use conservation tillage to leave 30-70% crop residue throughout the crop rotation cycle. -Harvest as early as possible then seed cover crops. These will serve to anchor residue and soil. -Rotate with forage crops to reduce erosion by 40%. -Application of manure, compost or biosolids increase soil stability and organic matter, but ensure BMPs regarding tillage are used. Crop Rotation – by planting soil-enhancing secondary crops, you increase soil organic matter content and crop nutrients, soil structure and the rooting depth available to primary crops. Using silage corn as an example of a primary crop, the first two years of corn would be followed by three or more years of forage. Cover cropping, no-till planting, or mulching should be implemented in this rotation. If grain corn and silage corn are the primary crops, the grain corn should be planted on any sloping fields. Grain corn leaves considerably more residue on the soil surface than silage corn, increasing soil retention. A minimum of 10 cm of growth should be present before winter. If this growth is not achieved by the end of November then the field should be mulched. Cover crops can be seeded by conventional methods, by no-till drills or by broadcast seeding 2 to 5 days prior to a crop harvest. Mulching is the practice of applying organic material over exposed soil. Hay provides the best mulch as long as it is harvested before the weed content has gone to seed. Straw can also be used. Mulching should occur after late season crops (i.e. potatoes and corn) are harvested. Positioning round bales throughout the field prior to mulching will save time and enable up to 10 ha to be mulched in a day. Mulching on frozen ground greatly decreases the formation of ruts which can carry water and soil away. Once spring arrives, the organic matter can be tilled under to improve soil quality.